Sadly, the original website and domain name disappeared in early 2012. The good news is, as you can see, we’re back and even better than before (well, we think so anyway.) 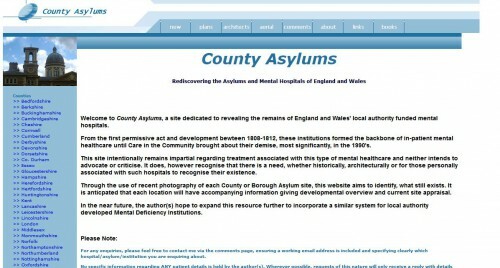 – we’ve comprehensively covered all the county asylums and some more on top of that. We know the subject of the asylums can be a sensitive one. We’re not here to glamorise what they were because we know not all of it was good. However we shouldn’t just forget about these buildings because of what went on once built. From a purely architecture point of view these buildings ranked amongst some of the most impressive designs of the time and some of the logic behind the designs was ground breaking. It’s been a project that started not long after the original site disappeared. 3 years work and we’ve finally made it. Where as it was just Pete before we’re now a nicely sized team of 4 and we’ve enjoyed working together. As time goes by we hope to continue to improve the details of the asylums listed and add additional institutions as we can. We’ve plenty of avenues, not least starting with the Scottish asylums. So thanks for visiting and please keep an eye on the blog as we’ll post updates/interesting news as we go.